How Should We Choose People for Positions of Authority? Promote an increased understanding of institutions of our constitutional democracy and the fundamental principles and values upon which they were founded. Increase understanding and willingness to use democratic processes when making decisions and managing conflict, both in public and private live. 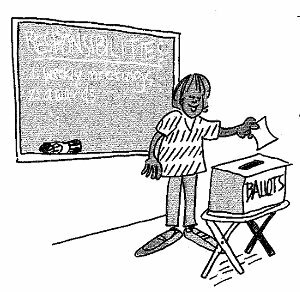 It is organized around four concepts, authority, responsibility, justice and privacy, which form part of the common core of civic values and concepts that are fundamental to the theory and practice of democratic citizenship in the United States. This particular lesson is adapted from Unit 2 of the Authority concept. Students learn that under our system of government citizens have to choose people for positions of authority. It is important to know how to choose well. This lesson helps students to identify the requirements of a position of authority and the qualifications a person should possess to fill that position. Students learn a set of intellectual tools designed to help them both analyze the duties of the position and to decide if an individual is qualified to serve in that particular position. During the lesson students practice using the intellectual tools. In this lesson you learn how to select someone to fill a position of authority. You learn how to use a set of intellectual tools—questions that guide your thinking through a problem—­to help you decide who is best qualified to fill a position of authority. When you finish this lesson, you should be able to explain the powers, duties, privileges, and limits of a certain position of authority. You also should be able to explain the qualifications a person should have to fill the position. Name people in your community that have authority? What kind of authority do they have? Have you ever been a candidate for a position of authority or had the responsibility of choosing someone to fulfill a position of authority?
? What do you think are the duties of a teacher, a principal, a police officer, and a city council member?
? What qualifications do you think a person should have to do a good job in each of these positions? Why should we know how to choose people for positions of authority? You probably have already had the chance to choose someone for a position of authority. In your school you might elect class officers. You might have chosen a team captain or voted for hall monitors. Throughout your life you will be asked to make decisions about selecting the right person for a position of authority. Under our form of government We have the right to choose our leaders. It is important to know how to choose well. Can you describe the duties and qualifications of a class president? 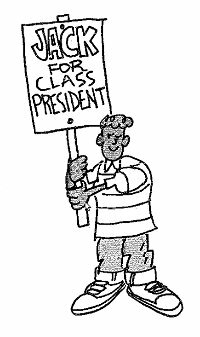 As you read "The Class Election," think about the duties of class president. Then think about qualifications a person needs to be a good class leader. Work with a partner to answer the “Apply your skills” questions. The students in Mr. Washington’s class decided they needed a class president. Kesha suggested they make a list of duties and powers the class president should have. She suggested the students then have a class election. Jack wanted the president to hold weekly class meetings. Alita suggested the president represent the class in the student council. Mr. Washington wanted the president to select the classroom monitors. He also wanted the president to give awards to monitors for doing a good job. Raoul said the president should be able to attend school events without having to pay. All the students in the class agreed with these ideas. The students decided these duties and powers should be enough for now. Later they might add more. The students decided they wanted to limit the president’s power. They thought that Mr. Washington should approve the president’s choices for classroom monitors. They also wanted the president to follow the current rules for holding class meetings. Students selected three people to run for the position. Everyone worked to elect their favorite candidate. Some students made posters. Others gave speeches before the entire class. They all discussed the strengths and weaknesses of those running for the position. On the day of the election, students counted the votes. The winner was Frankie Lee. 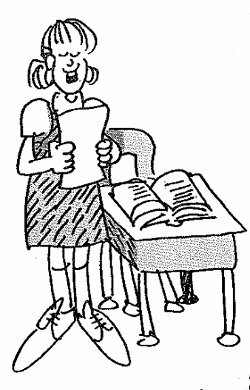 Frankie Lee was a good student, but she was shy in front of a large group. Frankie had a good attendance record. She had missed school only once this year. Frankie had never held a position of authority, but her older sister was president of the student council. Many students liked Frankie. A few thought she was “stuck-up”. Ken worried that Frankie might not listen to the ideas of other students in the class.
? What are some duties, powers, and privileges of the class president?
? What are some limits on the class president?
? What are some qualifications a person should have to be a good class president?
? What are some of Frankie’s strengths as a candidate for class president?
? What are some of Frankie’s weaknesses as a candidate for class president?
? Do you think Frankie will make a good class president? Why or why not? What should we consider when we choose someone for a position of authority? When a plumber fixes a leak, she reaches into a tool box for the proper tool to do the job. When trying to solve a problem, we want to ask the proper questions to help us think about that problem. We call the questions intellectual tools, or tools of the mind. The following are intellectual tools that can help us choose people for positions of authority. 1 What is the position? Before you can decide if a person can do a job well, you must first identify the position he or she is being asked to fill. 2 What are the duties, powers, privileges, and limits of the position? You must try to learn more about the position itself. What are the duties of the job? What powers will the person have? What privileges, if any, will the person get? What limits will the person have on his or her authority? 3 What qualifications should a person have to do the job well? You should think about the qualities a person should have to help him or her do the job well. A person in a position of authority should be able to treat people fairly, be a hard worker, and be honest. You also want to think about any special qualities a person needs to do the job well. A judge should know the law. A coach should know the rules of the game. A firefighter should be strong. Different positions require persons with different qualifications. 4 What are the strengths and weaknesses of the persons being considered for the position? You should compare the qualifications of each with the duties of the job. A person convicted of stealing money would not be a good candidate for the position of bank president. You also should compare the candidates with each other. Hazel has a high school diploma. Kareem has a college degree and he studies education. Kareem is more qualified for a teaching position. 5 Which person would best fill the position? Why? After you examine the position and compare the candidates, you should be able to decide which person is best qualified to do the job. You should be able to explain why you chose one person instead of another. Can you evaluate the candidates? You may now applied what you’ve learned to a new problem. The following people are running for mayor. The mayor heads the executive branch of city government. He or she has the duty to prepare the budget, appoint officials, and to propose legislation. The mayor also leads the city council meetings and may vote to break a tie. The mayor’s appointments must be approved by the city council and he or she must run for office every four years. How would you decide which person to vote for? The intellectual tool chart can help you evaluate the candidates. A sample of this chart is on the next page. Fill in the chart, explain which candidate you chose, and explain how you made your choice. Jane Yu. Yu is married and has two adult children. She has lived in the city all of her 52 years. During the last eight years, she served on the city council. She is known for being smart and honest. She ís a trained accountant and before she became a city council member she worked as a mediator. Hugo Herredia. Mr. Herredia is 26 years old. He came to the city four years ago to work in the parks department. ln college he was captain of his basketball team. While in the army he won a medal for bravery. He also lost his eye sight when he was wounded during the Iraq War. He is energetic and wants to bring new ideas to government. He already has plans for fighting crime in the city and he has met with the heads of some city agencies. What are the duties, powers, privileges, and limits of the position? What qualifications should a person have to do the job well? What are the strengths and weaknesses of the candidates? Who would you select? Why? 1 Interview someone who selects people for positions of authority: a person who hires police officers, teachers, store managers, crossing guards, etc. Ask what qualifications that person looks for when he or she interviews people for a job. 2 Read a newspaper article about your favorite sport. Find out the duties of the coach. Describe the qualifications, talents, and knowledge that someone in the position of coach should have. Note to teachers: If you enjoyed this Foundations of Democracy lesson, please consider purchasing the Foundations of Democracy textbook on Authority that contains this lesson and many others. evaluate, take, and defend positions on the proper scope and limits of authority. 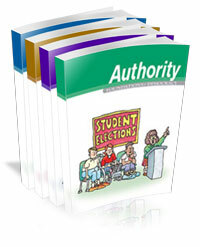 For more information, or to purchase the Authority textbook, click here. If you would prefer to make a donation to help the Center to continue offering free lesson plans like this one, please click here.